Despite this, digital media continues to have an air of mistrust around it – particularly from those not directly involved with the industry. Unlike more traditional, mainstream media outlets, the content we access online is often user-generated and created with SEO in mind – a concept that MOZ CEO Rand Fishkin describes as having a similar reputation to the “used car salesman” or “wrongful injury attorney”. To shed some light on exactly how much trust we have in the technologies we rely on, we surveyed 2,000 Brits about their internet use. With questions ranging from our understanding of paid adverts to our attitude towards spam emails, the results show a distinct lack of knowledge and familiarity regarding the tools we use every day. Of those surveyed, 1 in 10 admitted to browsing upwards of 50 websites per day, tying in with the rising trend of worldwide internet usage. Yet it would seem that just because we’re using the technology, it doesn’t necessarily mean we have a deep understanding of it. Perhaps most surprising is our knowledge of organic vs paid advertising, with a huge 60% of respondents unable to differentiate between Google sponsored ads and organic results. Despite this, only 3.4% of Google’s search queries result in a click on a Google ad. While audiences may not be able to spot a paid for ad when they see one, it seems that there’s a distinct lack of trust towards the results highlighted at the top of SERPs. As Google continues to alter the way that such results are labelled however, it could be argued that users are being increasingly hoodwinked. Gone are the days of clear shading around sponsored ads – to have been replaced by a subtle green ‘Ad’ tag and thin border. 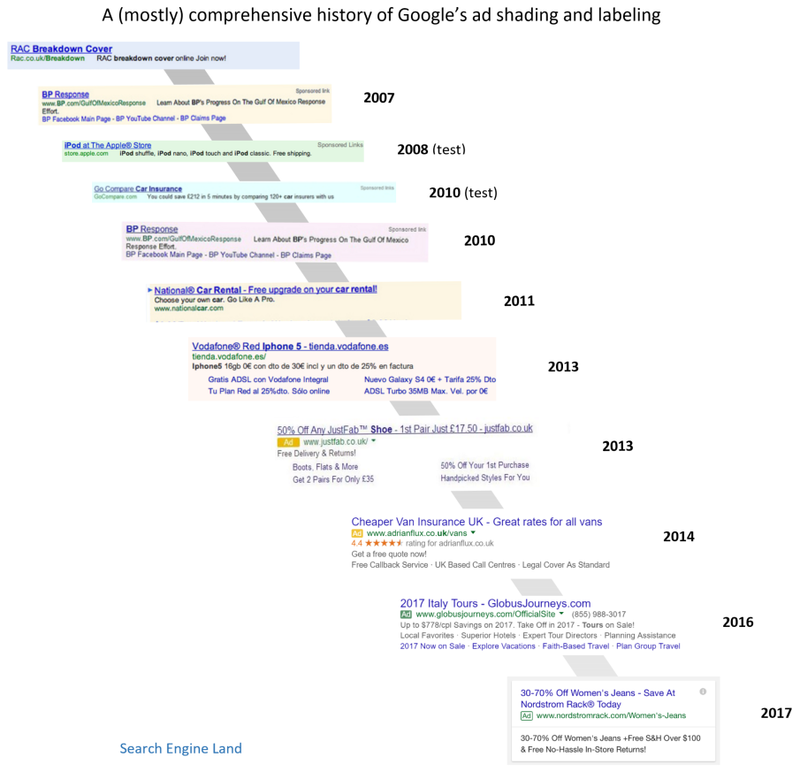 The below graphic from Search Engine Land visually demonstrates just how much labelling has changed over the past decade alone, suggesting that the growing trend for more subtle labelling may continue to confuse Google users over coming years. Spam emails have long been a bugbear of internet users across the globe. And despite ongoing efforts from email providers to keep unwanted mail to a minimum, many of us are still seeing far more spam than we’d like. A quarter of those surveyed say they receive more than 25 unsolicited emails every day – close to 9,000 over the course of a year. There are a number of ways to reduce the number of spam messages that you receive, yet even in 2017 it seems unlikely that the problem will be resolved any time soon. Spam still accounts for over 50% of email traffic worldwide, highlighting just how prominent the problem of unwanted messages continues to be. In a world saturated with fleeting social media trends and so-called ‘fake news’, our survey shows that there’s a great deal of debate over how much we can trust the content we consume online. While 68% of respondents admitted to reading online reviews before making a purchase, closer to 50% said that they felt these reviews were trustworthy. If this trend continues, we could see a big change to influencer marketing strategies that have taken centre stage over recent years. Individuals who have built brands on the basis of audience trust may begin to suffer, as a rise in paid advertising brings the potential to lower trust levels even further. It’s been estimated that 95% of us suspect the presence of censorship if bad scores are omitted from online reviews, demonstrating our desire to verify their authenticity. 57% of our respondents use social media as a news source daily, with a total of 81% reading news via social media at least once a week. Pair this with the 57% who believe that social media is to blame for the rise of fake news, and we begin to get a deeper understanding of why internet users so broadly disagree about what content can and can’t be trusted online. The term ‘fake news’ gained prominence during the 2016 US Presidential Campaign, yet political propaganda is nothing new. Perhaps what’s different now however is the sheer speed and scale at which such stories can spread, thanks in no small part to social media. If close to half of us are turning to the likes of Facebook, Twitter and LinkedIn for our digital news round-up, exactly how much the spread of fake news will harm user trust is yet to be seen. Online privacy is a hot topic in 2017, and for good reason. More than 55% of us admit to worrying about our privacy online, while a whopping 59% don’t believe that digital content is being effectively policed. Despite so many of us relying heavily on the internet day-to-day, there continues to be large discrepancies in regard to how much we trust and understand the online world. Such findings could alter the content marketing landscape dramatically over coming years, as users become increasingly wary of the safety and reliability of the content they consume online. As the online world continues to be saturated with content deemed untrustworthy, the pressure is on for brands and businesses to establish themselves as a reliable source of knowledge and expertise. To discover how we can help you to build a positive brand-audience relationship, get in touch today.